Product #1624 | SKU 1365657 | 0.0 (no ratings yet) Thanks for your rating! 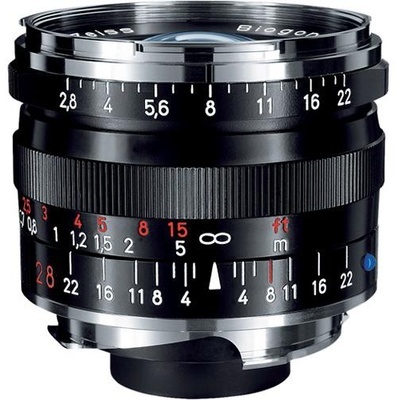 A classic wide-angle prime for M-mount rangefinders, the black Biogon T* 28mm f/2.8 ZM from ZEISS is a versatile lens well-suited to travel, landscape, and other documentary applications. Its Biogon optical design effectively eliminates distortion for well-corrected imagery and one anomalous partial dispersion element is used to reduce chromatic aberrations and colour fringing for notable clarity. A T* anti-reflective coating has also been applied to individual elements to reduce lens flare and ghosting for greater colour accuracy and contrast in strong lighting conditions. Additionally, the lens's manual focus design permits working with subjects as close as 50 cm away. One anomalous partial dispersion element is used to minimise chromatic aberrations and colour fringing for increased clarity and colour accuracy throughout the aperture range.